van der Krogt, Koeman’s Atlantes Neerlandici, Vol. III B, 352:51, 50. – Zeigt den Kontinent Asien mit China, Korea, Japan und Südostasien etc. – Unten links runde Titelkartusche. – Unten rechts Meilenzeiger. – Im Indischen Ozean Windrose. 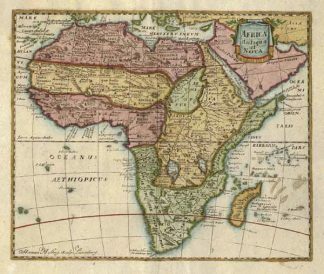 – Extrem seltene Karte aus dem „Nouveau Petit Atlas“ den Pieter van der Aa um 1714 herausgegeben hat. – Er verwendete fast alle Karten aus Janssonius’s Atlas Minor als Grundlage und veränderte die Kartuschen, fügte Windrosen hinzu, entfernte alle Texte, Kustoden und Nummern sowie eine teilweise Veränderung der Typographie. 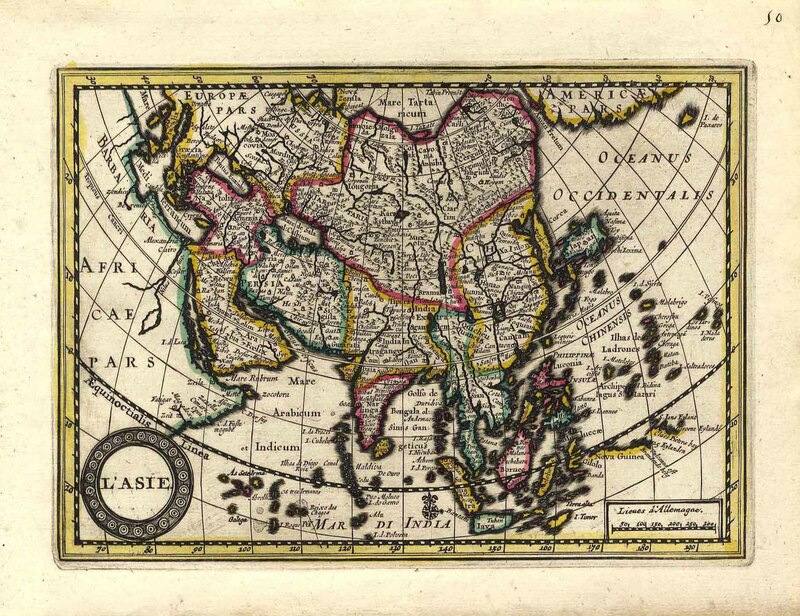 – Van der Krogt kennt nur ein komplettes Exemplar des Atlases (der Atlas besteht aus 9 Teilen) in der Universitätsbibliothek Leiden.ASIEN (Asia): ‚L’Asie‘: oldcoloured cooper-engraving from „Nouveau Petit Atlas ou Nouvelles Cartes Geographiques …“ by Pieter van der Aa in Leiden (Netherland), 14,5 x 20,5 cm, ca. 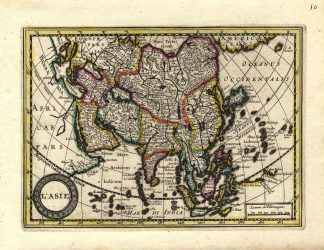 1714*van der Krogt, Koeman’s Atlantes Neerlandici, Vol. III B, 352:51, 50. – The map shows Asia with China, Korea, Japan, South-East-Asia with Phillipines etc. – At the bottom left round titelcartouche. – At the bottom right cartouche with mileage scale. – At the bottom wind rose. 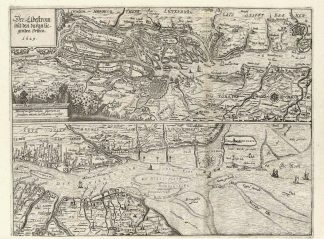 – Extremely rare map from the „Nouveau Petit Atlas“ appeared by Pieter van der Aa 1714. – He almost used maps from Janssonius’s „Atlas Minor“ as the basis and changed the cartouches, added wind roses, removed text, numbers and shelfmark and by a part of maps he changed the typography. 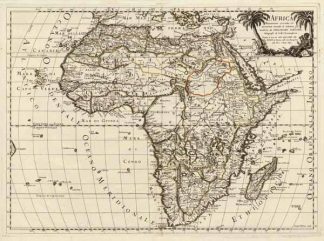 – Van der Krogt knows only one complete copy of the atlas (the atlas consists of 9 parts) in the Leiden University Library. Sie sehen: ASIEN (Asia): 950,00 € inkl. MwSt.